The original house on the site, built in the garden of 1 Bentley Road, dated from ca. 1970. This was extensively gutted and rebuilt and extended, resulting in this new house. The main feature of the original house was a mono-pitched roof at the right and the slope for this has been reversed in the new house. The original house also had timber cladding for this part, but it was painted black. The rest of the original house was all one storey. 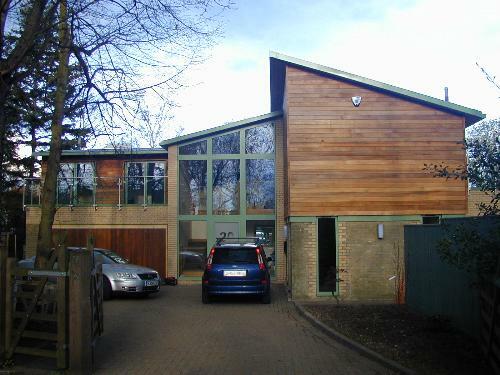 The two storey extension, in the centre and at the left, adds a large amount of space, although the overall footprint is approximately the same as the original house.